Can the Guardians of the Galaxy defeat a supremely powerful entity? An orb contains a power too great to be safely harnessed. It is desired by Thanos, a supremely evil being, who wishes to increase his power. It is also desired by others, who wish to sell it for profit. An unlikely team comes together to protect the universe from the power of those who would destroy it. 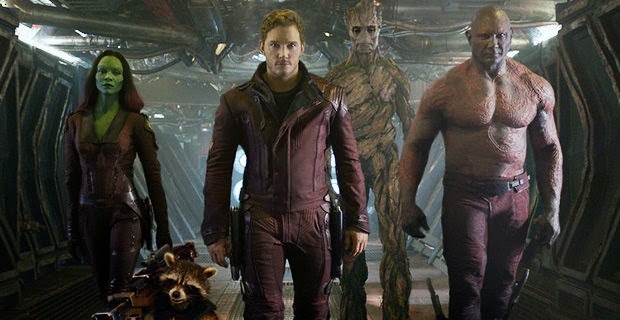 A thief named Starlord, bounty hunters named Rocket and Groot, a strongman named Drax the Destroyer, and an assassin named Gamora learn to trust each other in spite of initial conflicts. Together, they will try to grow from self-seeking loners into heroic friends. While they’re at it, they might just save the world. Or even the galaxy. How Does This Connect to Adoption and Foster Care? The film directly mentions adoption once. One of the characters is introduced as the adopted daughter of a villain. Later, she renounces him; “He’s not my father.” She explains that he murdered her parents, tortured her and bent her to his will. I see a lot of relevance in the film’s opening scene. A young boy named Peter is in the hospital. His mother is lying in her hospital bed, apparently bald from cancer. She is on the verge of death. She asks Peter to hold her hand; he turns away, unable to reach out to her. Immediately, she dies, calling for the hand that he never gave her. Peter, grief and guilt-stricken, screams. It is too late. He runs away from his grandfather and collapses outside. There, a spaceship abducts him. 26 years later, we learn that Peter has become a loner, intergalactic thief. This sequence reminded me powerfully of a child’s introduction to foster care. A child coming into foster care because of abuse shares much with Peter. They both observe or experience a traumatic situation, for which they feels justifiable grief and undeserved guilt. Immediately afterwards, they are picked up by strangers and taken to unfamiliar surroundings. All this happens even before the opening credits. It’s pretty intense. We spend the rest of the film seeing how Peter’s character has developed. Peter draws considerable strength from the memory of his mother. We are left looking forward to Peter meeting his long-lost father. Peter has experienced hardship, but inside he still has a heart of gold. 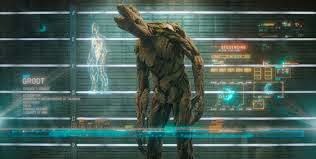 The Guardians of the Galaxy are a diverse group who have become friends through shared experiences. They acknowledge, together, that they have lost many important things, but have hope that they can still make a difference in the lives of others. The movie has heavy doses of comic relief – I enjoyed this film more – and had more fun watching it – than any other I’ve seen this year, and this was the most appreciative audience I’ve been a part of. Grout is a tree. In one scene, he grows his body around his friends, to demonstrate his sense of unity with them. It’s very touching. 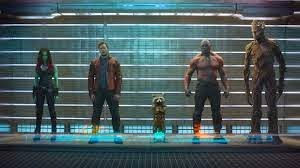 The Guardians of the Galaxy grow into believable heroes who are willing to do the right thing, even when it is supremely difficult. One character honestly and hatefully describes her adoptive father as a murderer torturer. The alien who abducted Peter seems to present himself as a father figure over Peter, but attempts to manipulate Peter by reminding him that Peter is online alive because of him. Later, that character threatens to kill Peter. Peter yells at him, “You abducted me, and stole me from my home and family.” The character had been hired to bring Peter to his father, but changed his mind and absconded with Peter. Young kids may be scared by some of the violence in the film. One character gouges another’s face, though the gore is just off-camera. Another character murders a man by hitting him in the head with a sledgehammer – again, the violence is just off-camera, but we do see the victim’s blood. One character recounts that his wife and daughter were murdered while their murderer laughed. A woman disintegrates. A woman is disfigured by a shot from a bazooka. A character is told that others wanted to eat him. One character holds a knife to another’s throat. Many characters are tazed. Larger animals eat smaller ones. Revenge is a strong motivator for both heroes and villains. 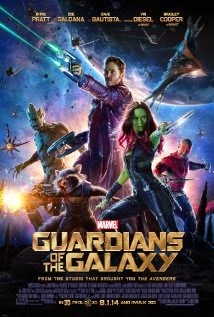 Guardians of the Galaxy is an excellent film for most audience members age 14 and up, but it will probably also appeal to kids as young as 5 (it’s a superhero movie with a raccoon as a lead character) – but it’s too violent and, at times, too sad for me to recommend it for young viewers. The opening scenes depicting Peter’s loss of his mother may also be very difficult, and perhaps triggering, for viewers who have lost their mothers through death or foster care. However, there’s a lot of positive potential in the fact that, in spite of his losses, Peter has become a very heroic man who is loyal to his friends and to the world in general. I enjoyed this film quite a lot. It’s well-made, fast-paced, deeply plotted, and very funny. I do recommend that parents scope it out before sending their kids. With that caveat, I think it should be a good fit for most teens and adults, but not for many kids younger than 13 or 14. How can enemies become friends? How can pain from our past become a source of strength for today?